Why isn’t bitcoin easier to use? It’s been around for 8 whole years, and it still isn’t as easy as other popular services like Paypal or Venmo. And if bitcoin isn’t easy to use, why do people even bother? 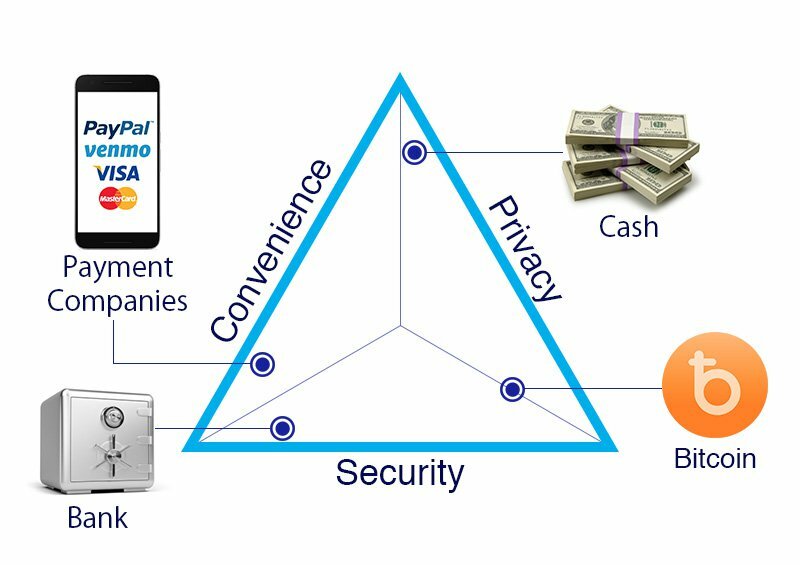 Every type of payment method can be rated according to three distinct characteristics: convenience, security, and privacy. For each of these aspects, a payment method can be good, bad, or somewhere in between. 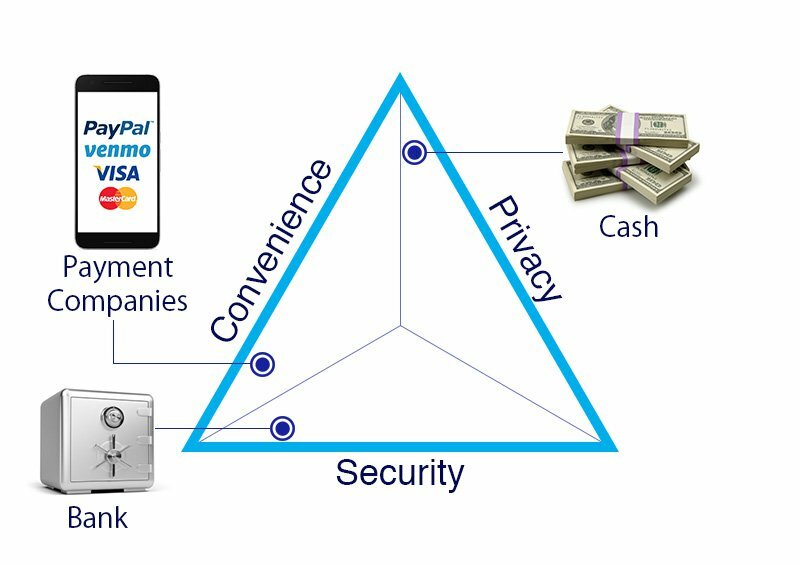 And from what we’ve seen so far, a payment method can only be good at one or two of these things, never all three. Let’s start with the most basic payment method: cold hard cash. Cash has great privacy because it allows you to make anonymous purchases. It is also quite convenient since everyone accepts it. However, it’s not quite as convenient as it could be, because it’s not possible to send physical cash over the internet. 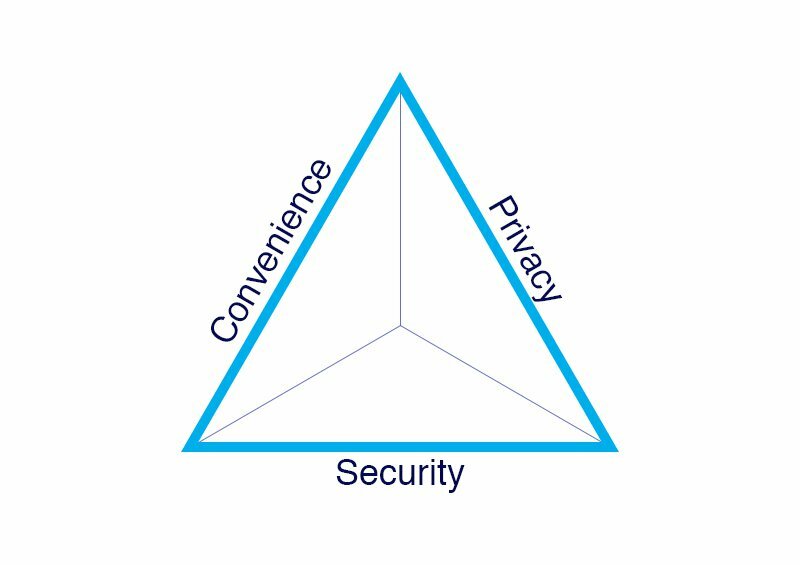 On our chart we would place it close to privacy and convenience, but a little closer to the privacy side since convenience could be improved. As you can see, it is far from the security side, which makes sense. Cash can easily be stolen or destroyed, and once it’s gone there is no way to get it back. People know this, which is why they tend to only keep a small amount of cash on hand and entrust the majority of their money to a specialist for safe keeping: banks. Banks are very secure. Keeping money locked down is their specialty. They also offer various services to make it more convenient to move your money around, in the form of checks and wire transfers. Of course, this extra security and convenience comes at a cost. In order for your bank to serve you they need to know everything about your finances, including where your money comes from, how much you have, and who you give it to. We will place them closest to security, while also near convenience. 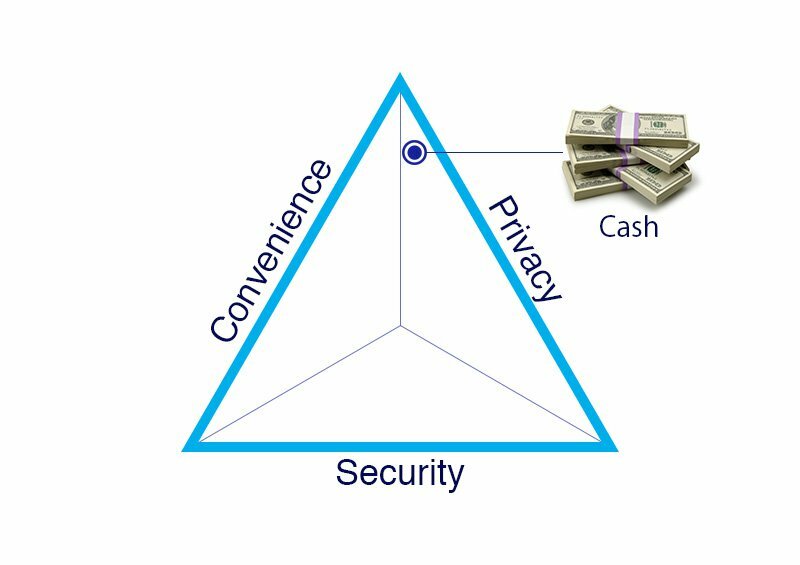 Like cash and security, banks are far from the privacy side of the triangle. Although banks are often times more convenient than carrying around large amounts of cash, they tend to be quite slow for many types of payments. For this reason, more convenient payment methods like Venmo, Paypal, and credit cards have largely replaced checks and bank transfers. These methods are also more secure than cash because you can cancel a transaction if it has been made in error, but they tend to be less secure than a bank account, with email accounts being hacked and credit card numbers being stolen every day. For most people, the convenience factor is so great they are willing to overlook any other downsides, including the fact that these companies can close your account or lock up your funds at any time and for any reason. These options are basically an improvement on the banking model, so we’ll start on the chart next to banks and move up towards the convenience side. No improvement in privacy here. So where does bitcoin fit in our chart? Although it may be difficult to use, and therefore inconvenient to get started, it has excellent security and privacy, which means it fills a space on our chart that was previously empty. 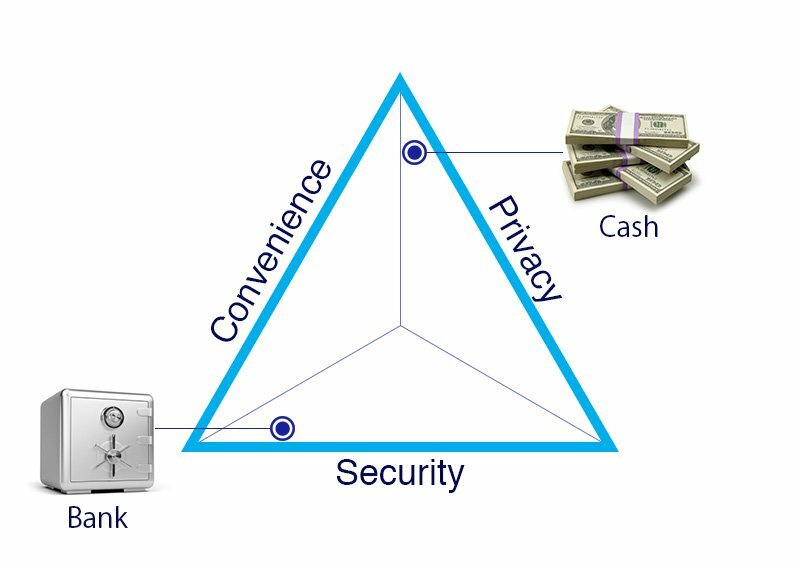 This space, the intersection of security and privacy, was previously only occupied by gold, precious gems, or even cash (if stored in a safe instead of a wallet). However, those payment methods are too inconvenient, so we won’t even put them on the chart. There is one problem with our chart. It shows the balance of each payment method’s focus on privacy, security, and convenience, but doesn’t actually show how well they do at these things. Even though bitcoin is far from the convenience line in terms of balance between these three characteristics, it’s already much more convenient than most banking services. We think this is truly amazing, because for the first time a digital currency has the potential to be as convenient as a credit card while also providing levels of security and privacy that were previously thought impossible to achieve. Bitcoin is still a work-in-progress, but is always improving and evolving at a quick pace. At breadwallet, our goal is to maintain bitcoin’s high levels of security and privacy while also making it as convenient as possible. 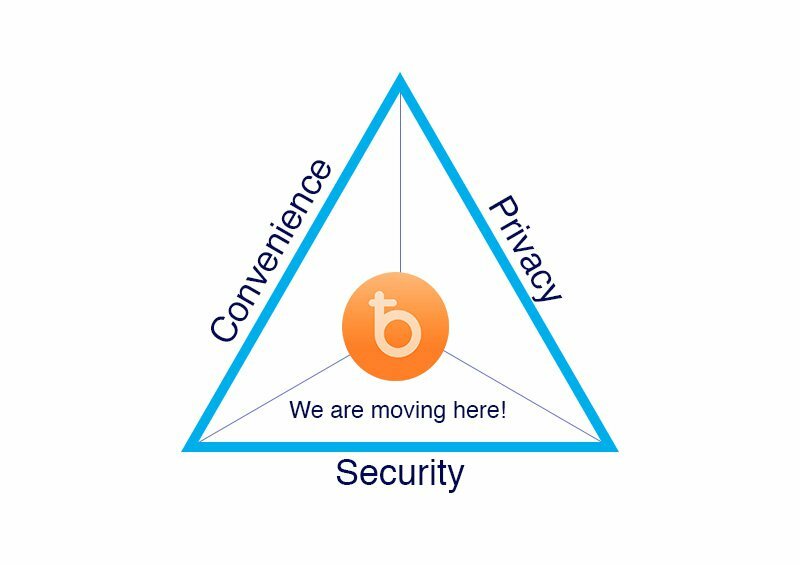 We are moving to the very center of the triangle. If we are successful, bitcoin will become the first payment method ever to perform equally well when it comes to privacy, security, and convenience. In Part 2 we will explore why so many people value privacy, and why you should too.